Type 2 diabetes is a prevalent chronic health condition that may significantly affect morbidity and mortality. In general, diabetes diagnoses of all types affect approximately 500 million individuals worldwide, with type 2 diabetes comprising the majority of these diagnoses (International Diabetes Federation [IDF], 2017). In 2015, the number of individuals in the United States alone who had been diagnosed with any type of diabetes was 23.1 million (an increase of more than 2 million from 2012), with another estimated 7.2 million undiagnosed (Centers for Disease Control and Prevention [CDC], 2014, 2017). Of individuals with diabetes, approximately 27.5 million (90% to 95%) have type 2 diabetes (CDC, 2017, 2018). American individuals 65 and older comprise a disproportionate number of those living with type 2 diabetes, with a prevalence rate of 25.2% (CDC, 2017). In addition, approximately one half of all older adults have been diagnosed with pre-diabetes. Self-management of type 2 diabetes is critical in maintaining health and preventing further disease-related complications (American Diabetes Association [ADA], 2018b.). Yet, self-management can be complex with expectations that patients manage medications, plan and eat diabetic meals, monitor and treat blood glucose, be physically active, and manage medical and educational visits (Weinger, Beverly, & Smaldone, 2015). Poor diabetes self-management can have detrimental multisystem acute and long-term effects, such as skin and eye complications, neuropathy, functional disability, coexisting illness (e.g., hypertension, stroke), and potential for death (ADA, 2018a,b). Self-management can be especially challenging for older adults (ADA, 2018b; Kirkman et al., 2012; Liddy, Blazkho, & Mill, 2014; Munshi et al., 2013; Weinger et al., 2015). As a result, older adults are at higher risk for experiencing complications, compared with others of the same age without diabetes and younger individuals with diabetes (ADA, 2018b.). Borhaninejad et al. (2017) found that diabetes self-management among older adults is significantly affected by knowledge, self-efficacy, social support, outcome expectations, outcome expectancy, and self-regulation. In addition, older adult with diabetes are at higher risk than those without diabetes for developing geriatric syndromes such as polypharmacy, cognitive impairment, urinary incontinence, falls, and depression, which further complicate self-management (ADA, 2018b; Weinger et al., 2015). Other issues, including vision and hearing impairment, functional disability, and persistent pain, are key contributors to older adults' ability to self-manage (Kirkman et al., 2012; Munshi et al., 2013). Older adults may also experience unique nutrition challenges that could interfere with self-management, such as difficulty shopping, paying for groceries, and preparing healthy meals. Moreover, cognitive impairment; gastrointestinal issues; poor dentition; and smell, taste, and swallowing problems can lead to under-nutrition and skipping meals (Kirkman et al., 2012; Munshi et al., 2013; Ojo & Brooke, 2015; Weinger et al., 2015). Cost is another concern, with more than one half of diabetes-related health care expenditures attributed to adults 65 and older (ADA, 2013). Despite many studies and reviews about diabetes self-management, few researchers focus specifically on older adults. Because challenges are multi-faceted, it is important to understand self-management barriers through patients' lenses and consider their perspectives of type 2 diabetes self-management. A review of qualitative literature addresses this perspective because qualitative methodology uses in-depth exploration and collection of data about individuals experiencing a particular phenomenon. The purpose of the current review was to examine and summarize the qualitative literature concerning type 2 diabetes self-management barriers in older adults. The state of the qualitative science, implications for nursing practice, and recommendations for future research are discussed. To promote a trustworthy review, a systematic and rigorous process should be used. Whittemore and Knafl's (2005) integrative review methodology guided the current review. Because this method is not specific to qualitative literature reviews, it was enhanced by Butler, Hall, and Copnell's (2016) guide for establishing a qualitative synthesis review protocol. Based on these methods, several steps were taken to conduct the review, including: identifying the purpose and rationale, identifying a search strategy, searching and retrieving qualitative research reports, screening relevant literature, critically appraising remaining reports, conducting a content analysis, and synthesizing findings (Butler et al., 2016; Whittemore & Knafl, 2005). An exhaustive literature search was conducted with the following steps: enlisting the assistance of a health sciences librarian, searching research databases, and conducting additional manual searches. A combined search of electronic databases on February 9, 2018, included Academic Search Complete, AgeLine, CINAHL Plus with Full Text, Food Science Source, Health Source: Nursing/Academic Edition, MEDLINE, MEDLINE Complete, MEDLINE with Full Text, SocINDEX with Full Text, and Sociological Collection. English language, peer-reviewed studies published between 2007 and 2018 were identified using the search terms: “type 2 diabetes or type 2 diabetes mellitus or t2dm or diabetes type 2 or diabetes mellitus type 2” AND “self-management or self-care or self-regulation or self-monitoring or self-care management” AND “older adults or elderly or seniors or geriatrics” AND “qualitative research or qualitative study or qualitative method or qualitative design.” Studies focusing on gestational diabetes or type 1 diabetes, and any studies receiving a score less than six on the Critical Appraisal Skills Programme (CASP; 2018) qualitative review checklist, were excluded. Browsing and berry-picking search methods (Sandelowski & Barroso, 2007) were also used to ensure as many relevant studies as possible were captured. With these methods, the researcher used additional approaches beyond structured, systematic literature searching to identify additional pertinent studies, such as manual internet searching and reviewing reference lists. In the initial literature search, 40 potential sources were retrieved once duplicates were removed. An additional nine studies were identified by browsing and berry-picking methods. Titles and abstracts of each study were reviewed for relevance to the topic of type 2 diabetes self-management barriers and/or challenges in older adults. If sources met these criteria, they were screened for sample age of 60 and older. Although the CDC (2015, 2017) defines older adults as 65 and older, there is a mix of research focusing on this population that identifies samples as 60 and older or 65 and older. Many studies screened for this review with samples 60 and older had a mean age ≥65. Therefore, these studies were included. One qualitative study had an age range wider than the desired sample but provided an individual itemization of participant ages and reported only one participant younger than 60. This study was retained, as it was largely representative of the older adult population. From the screened sources, 12 studies were eligible for critical appraisal. 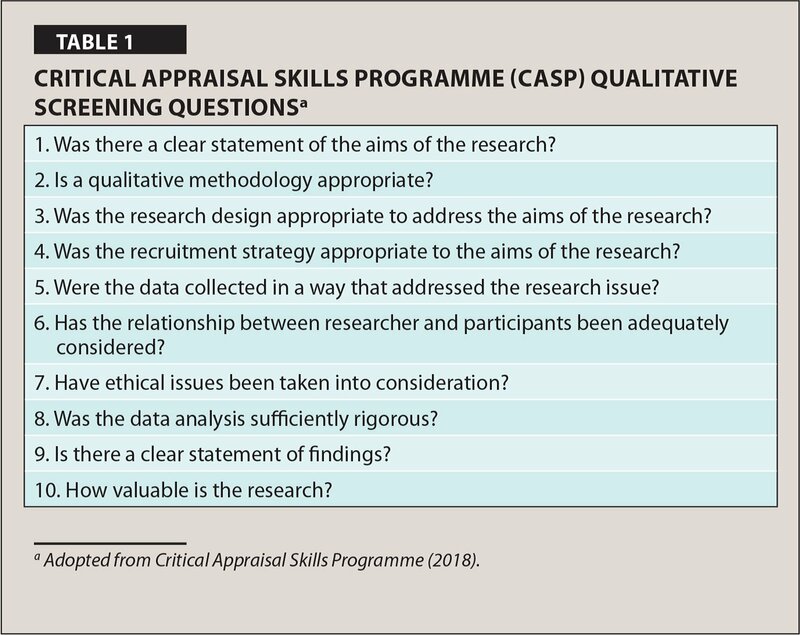 The CASP (2018) qualitative review checklist and a correlating scoring system developed by Butler et al. (2016) were used to conduct a critical appraisal of the qualitative studies selected for further review. This checklist offers a systematic way to appraise all types of qualitative data to determine rigor, trustworthiness, credibility, and relevance to the current review (Butler et al., 2016; CASP, 2018). CASP is a 10-question (Table 1), rapid evaluation tool with several cues to assist in determining an answer to each question. It has been used in many types of reviews that include qualitative literature (Andrew, Traynor, & Iverson, 2015; Colborne & Dahlke, 2017; Duggleby et al., 2012; Liddy et al., 2014; Sullivan & Williams, 2017). The CASP checklist contains two initial screening questions to determine if further appraisal is warranted. The scoring system awards up to 1 point for each question on the checklist. If the answer to a question is yes, the item receives a score of 1; if the answer is can't tell, the item receives a score of 0.5; and if the answer is no, the item receives a score of 0 (Butler et al., 2016). Score ranges include: high-quality article (9 to 10), moderate-quality article (7.5 to 8.5), low-quality article (6 to 7), and exclude (<6). Using this system, a score was calculated for each article. Ten studies with a mean score of 8.75 were retained. Two studies were excluded; one had a score of 3 and another did not pass the first two screening questions. Figure 1 details the search, screening, and appraisal process used in this review. Flow diagram of articles reviewed, screened, critically appraised, and included in the qualitative integrative review. Inductive content analysis was used to synthesize extracted data from the 10 studies (Elo & Kyngäs, 2008). The steps of inductive content analysis include open coding, categorization, and abstraction of data synthesized from themes, participant quotes, and researchers' conclusions in each study. Coding was conducted throughout the process of data extraction by writing notes and headings in the text. Headings were recorded and categories were generated. Categories were then grouped into higher-order headings, or themes, as a part of abstraction. In addition, audit with an experienced researcher with extensive expertise in qualitative research was used to confirm analysis. Ten articles from nine qualitative studies (two articles addressed the same study) were included in this integrative review (Table 2). Five studies were conducted in the United States and four in other countries: Korea (n = 2), China (n = 1), and Denmark (n = 1). Two studies were mixed methods with unspecified approaches to qualitative analysis using focus groups or in-depth interviews (Aponte & Nokes, 2017; Grzywacz et al., 2011). Two studies were qualitative descriptive, using focus groups (Shen, Edwards, Courtney, McDowell, & Wei, 2013) or focus groups and in-depth interviews (Joo & Lee, 2016). Authors of five studies did not specify qualitative approach but reported data collection using in-depth interviews or focus groups (Beverly, Wray, Chiu, & Weinger, 2011; Beverly, Wray, Chiu, & LaCoe, 2014; Choi, Song, Chang, & Kim, 2014; Laursen, Frølich, & Christensen, 2017; Morrow, Haidet, Skinner, & Naik, 2008; Song, Lee, & Shim, 2010). 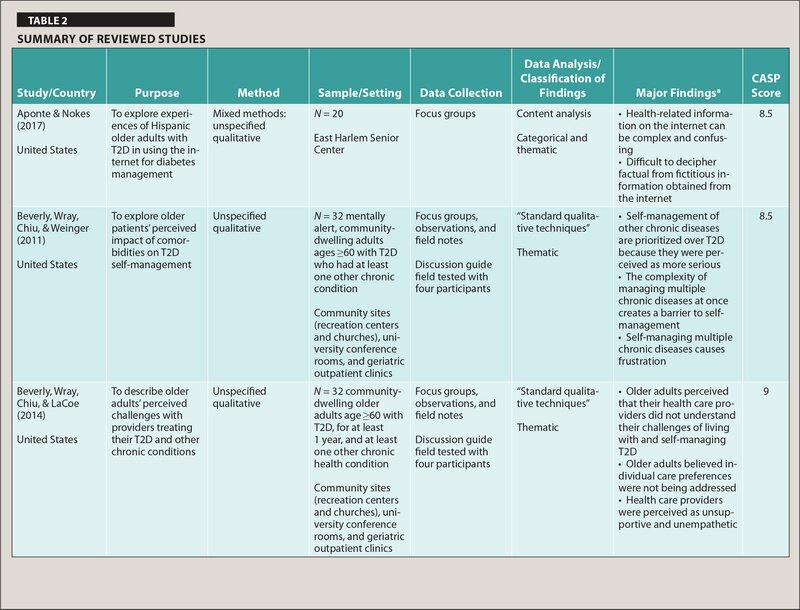 Although many studies had unspecified approaches to qualitative analysis, methods described by researchers were indicative of qualitative descriptive designs (Kim, Sefcik, & Bradway, 2017). In addition to focus groups and interviews, studies included researcher observations and field notes (Beverly et al., 2011; Beverly et al., 2014; Joo & Lee, 2016; Laursen et al., 2017; Song et al., 2010). Sample sizes ranged from 11 to 74, with 237 participants across studies. Content analysis revealed common type 2 diabetes self-management barriers. From these barriers, four themes emerged: Lack of Knowledge and Understanding, Self-Management Implementation Challenges, Culture and Language Barriers, and Health Care Providers as a Perceived Barrier. Lack of knowledge and understanding about type 2 diabetes and self-management strategies was a common barrier (Aponte & Nokes, 2017; Grzywacz et al., 2011; Joo & Lee, 2016; Laursen et al., 2017; Morrow et al., 2008; Shen et al., 2013; Song et al., 2010). Many participants described difficulty understanding information from formal diabetes self-management education (DSME), reading materials, or other resources, which often caused frustration, confusion, and overwhelmed feelings (Aponte & Nokes, 2017; Grzywacz et al., 2011; Laursen et al., 2017; Morrow et al., 2008; Song et al., 2010). Laursen et al. (2017) reported that although “healthy” participants had positive experiences with DSME, “ill” participants described difficulty understanding information and were less likely to implement changes. Accessing, using, and evaluating technology resources also contributed to lack of knowledge and understanding about type 2 diabetes self-management. For some older adults, figuring out how to get started with finding self-management resources was a barrier (Joo & Lee, 2016). Older Hispanic participants had difficulty deciphering accurate from inaccurate information, especially from internet resources (Aponte & Nokes, 2017). Although technology is often a self-management facilitator, Aponte and Nokes (2017) found that more than one half of participants reported they were not technologically savvy and therefore had difficulty accessing resources. Many were overwhelmed and confused with internet and technology resources, believed there was too much searchable information, or found information hard to understand (Aponte & Nokes, 2017; Morrow et al., 2008). Despite having an understanding of type 2 diabetes self-management, some participants did not follow regimens for a variety of reasons. Intentional Avoidance. In some cases, participants described feelings of not being ready or not wanting to make changes. Changing behaviors related to diet, weight control, and exercise were most commonly seen as obstacles (Grzywacz et al., 2011; Joo & Lee, 2016; Laursen et al., 2017; Morrow et al., 2008; Shen et al., 2013; Song et al., 2010). In several instances, participants accepted experiential knowledge over research evidence (Choi et al., 2014; Grzywacz et al., 2011; Shen et al., 2013). For example, participants favored folk medicine (Grzywacz et al., 2011) or preferred to manage diabetes based on how they felt or what they deemed was best (Grzywacz et al., 2011; Song et al., 2008). Others considered Eastern treatments more beneficial than Western medicine (Shen et al., 2013). As a result, many participants discussed knowing Western medications work quickly to treat diabetes; therefore, they took medications until their diabetes was under control, and then took less or stopped taking medications altogether. Cost. Cost of care was an issue for many older adults self-managing type 2 diabetes. Fixed incomes and/ or multiple comorbid conditions requiring costly treatments were a significant barrier (Beverly et al., 2011; Joo & Lee, 2016). Chinese participants reported that diabetic testing supplies were not covered by Chinese medical insurance and were often too costly for them to afford (Shen et al., 2013). Although the hospital provides free testing, access and transportation to obtain this benefit was a common problem. Difficulty Self-Managing Multiple Comorbid Diseases and Conditions. Older adults reported having to manage one or more acute or chronic conditions along with type 2 diabetes (Beverly et al., 2011; Joo & Lee, 2016; Laursen et al., 2017; Morrow et al., 2008; Song et al., 2010). For many participants, physical or functional issues (e.g., arthritis) limited adherence to self-management activities such as exercising (Joo & Lee, 2016; Laursen et al., 2017; Song et al., 2010). Participants also reported choosing to manage one condition over another due to lack of time and resources (Beverly et al., 2011; Joo & Lee, 2016). In some cases, participants viewed diabetes as less serious because immediate consequences were not seen or felt (Beverly et al., 2011). Therefore, management of diseases and conditions thought to be more severe or imminent were prioritized over type 2 diabetes. Living on fixed incomes also resulted in selective management of other diseases over type 2 diabetes (Beverly et al., 2011; Joo & Lee, 2016). In addition, conflicting treatment regimens from multiple health conditions created frustration, confusion, and overwhelmed feelings, leading to selective management for some individuals (Beverly et al., 2011). Diminishing cognition and memory loss were other barriers to type 2 diabetes self-management. Participants reported difficulty remembering to check blood glucose and take medications (Choi et al., 2014; Laursen et al., 2017; Song et al., 2010). These tasks were either completed later than prescribed or missed altogether. Participants in studies conducted outside the United States and among Korean American immigrants addressed self-management barriers connected to culture and language (Joo & Lee, 2016; Shen et al., 2013; Song et al., 2010). Korean American immigrants experienced self-management challenges because of inability or limited ability to read or speak English (Joo & Lee, 2016). This barrier made reading self-management education resources and communication with providers difficult. Some participants believed that even though they could speak English well, discussing their diagnosis and self-management was difficult because medical information was not a part of their everyday terminology. In Korean and Chinese cultures, family roles are vitally important. Women in particular were expected, or felt the need, to maintain family responsibilities, such as cooking, keeping house, and caring for grandchildren, resulting in less time for self-management (Shen et al., 2013; Song et al., 2010). Cooking foods to meet tastes of others in the house, but not diabetic dietary needs, is another problem. In general, cultural foods were important to participants, leading some to refuse making changes in eating habits. For Korean men, abstaining from alcohol in larger quantities was difficult at times because drinking during social events is an expected norm (Joo & Lee, 2016; Song et al., 2010). Participants reported issues with health care providers or DSME educators who were perceived as barriers to self-management (Beverly et al., 2014; Grzywacz et al., 2011; Laursen et al., 2017; Shen et al., 2013). They sensed a lack of support from health care providers and educators, believed providers ignored individual preferences for care, and believed they received less proactive treatment due to age and diabetes diagnosis (Beverly et al., 2014). Some participants felt rushed, leaving little time to discuss concerns, or sensed their providers were uninterested in what they had to say (Beverly et al., 2014; Shen et al., 2013). Other participants conveyed a general lack of trust for providers (Beverly et al., 2014; Grzywacz et al., 2011; Laursen et al., 2017). Ill participants, defined as those who reported diabetes complications or feeling ill, had limitations in daily living, experienced travel or social limitations, and described negative experiences with DSME, including frustration by a perceived lack of knowledge among educators and general practitioners (Laursen et al., 2017). Barriers encountered by older adults with type 2 diabetes can be detrimental to successful self-management and lead to future complications. Individuals report difficulty with diabetes self-management across the lifespan, yet older adults face unique challenges. 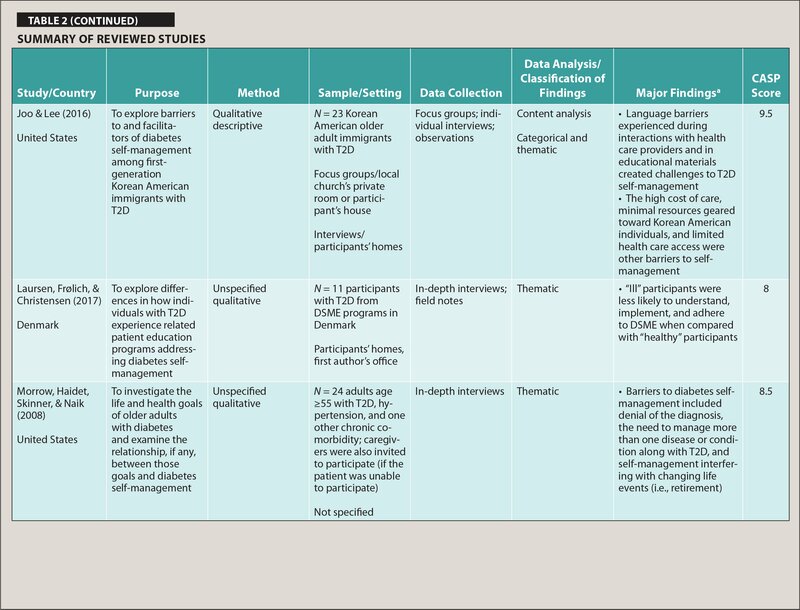 The findings of the current review advance previous qualitative research describing perceived type 2 diabetes self-management barriers of older adults. Although barriers are individualized, there were commonalities across studies. The themes of Lack of Knowledge and Understanding and Self-Management Implementation Challenges were among the most common barriers. There is evidence to support the use of self-management education programs in older adults for improving outcomes in diabetes care (Joo, 2014; Lorig, Ritter, Ory, & Whitelaw, 2013; Sherifali, Bai, Kenny, Warren, & Ali, 2015). It is important to use approaches that integrate interventions known to increase adherence to self-management in older adults (e.g., psychosocial support, group education), ensure understanding of education and resources, and assist patients to remove self-management implementation barriers (Munshi et al., 2013; Sherifali et al., 2015). Providing ongoing self-management support is crucial, particularly for older adults (Jutterström, Hörnsten, Sandström, Stenlund, & Isaksson, 2016; Powers et al., 2015). For individuals having difficulty getting started, or finding certain aspects of self-management particularly challenging, the inclusion of family and other types of social support may be one way to promote better adherence (Miller & DiMatteo, 2013; Schiøtz, Bøgelund, Almdal, Jensen, & Willaing, 2012). Patients with cognitive impairment will need an additional layer of support to ensure that medications and glucose monitoring are not missed and to prevent resulting acute and chronic complications (Koekkoek, Kappelle, van den Berg, Rutten, & Biessels, 2015; Ojo & Brooke, 2015). In addition, an awareness that technology may not always be beneficial for older adults is necessary. If using technology as an intervention with this population, further education about use may be needed. In general, a patient-centered approach when planning care can assist with removing barriers and improving adherence to self-management (Jutterström et al., 2016; Williams, Walker, Smalls, Hill, & Egede, 2016). 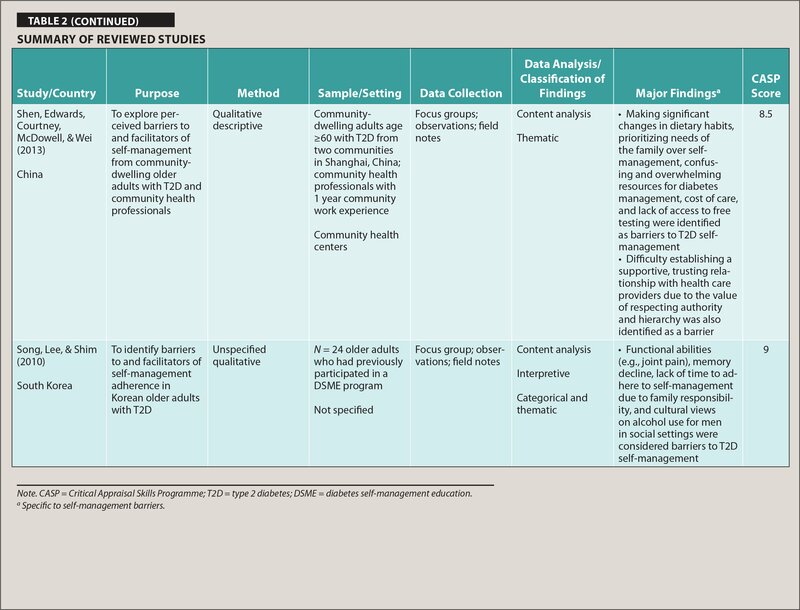 Self-management barriers created by language, cultural norms, and expectations of Korean and Chinese participants are particularly important and should be considered when planning care. Providers should reflect on how these types of barriers may affect older adults of other cultures and ethnicities. Resources and additional support to remove language barriers and increase cultural sensitivity in providers and educators is necessary. Use of culturally competent, individualized care is an important step for improving support and outcomes related to type 2 diabetes self-management (Joo, 2014; Peyrot et al., 2018). In the fourth theme, Health Care Providers as a Perceived Barrier, participants' perceptions of rushed visits and concerns related to lack of support are significant. Providers may need to consider building additional time into their interactions with older adult patients to ensure adequate time for clarification of treatment expectations and discussion of questions. An essential component to successful self-management is long-term health care provider support (ADA, 2018b; Brunisholz et al., 2014; Institute for Healthcare Improvement, 2018; Lorig et al., 2013). A patient-centered team approach with good provider–patient communication, trusting relationships, and shared decision making can improve patient satisfaction, treatment adherence, and ultimately lead to better overall outcomes (ADA, 2018b; Jutterström et al., 2016; Powers et al., 2015; Williams et al., 2016). Finally, feelings and emotions linked with type 2 diabetes self-management such as frustration, stress, anxiety, and being overwhelmed are an important finding. These feelings were often woven through participants' descriptions of barriers. The emotional connection associated with self-management should be considered when supporting patients throughout the self-management process. 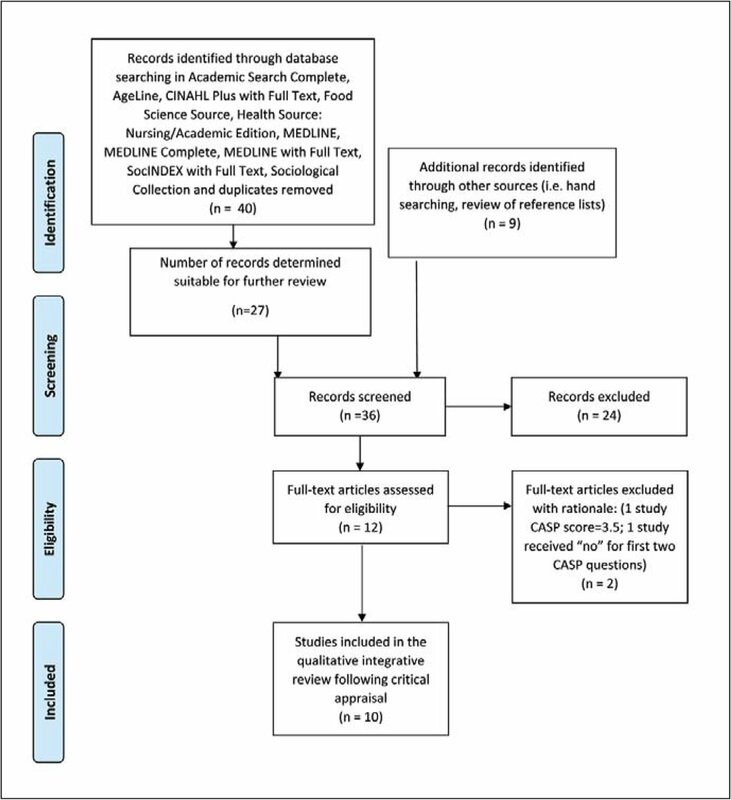 One researcher conducted the current review, and although the researcher worked to enhance trustworthiness through using systematic search methods, established review and analysis protocols, and audit with a colleague, a co-researcher could have strengthened and further validated findings. Moreover, the findings of the review are limited to older adults. Further review of the literature spanning a longer period might have revealed other studies focusing on a broader scope of older adults with diabetes, as well as additional type 2 diabetes self-management barriers. Nurses are in a prime position to identify barriers and provide support to older adults who are self-managing type 2 diabetes. Use of interventions that are culturally sensitive and address the literacy needs of older adults is essential. Ongoing support that includes assessment of knowledge and understanding related to type 2 diabetes self-management should be a priority (Jutterström et al., 2016). This support is especially important considering unique challenges that older adults can face that can progress over time, such as functional decline and/or cognitive impairment. Innovative ways to assist these patients to maintain independence or identify additional support from family or other caregivers with self-management regimen may be necessary. Collaboration with other members of the health care team is also an essential factor in relation to support. Although the findings of the current integrative review revealed valuable information for nursing practice, few researchers in the nursing literature addressed type 2 diabetes self-management barriers in older adults. This gap in research can be a key area for nurse researchers to advance the science of the discipline. In addition, more studies focusing solely on older adults across a broader range of cultures, races/ethnicities, and internationally and within the United States would be beneficial in addressing their unique self-management needs. The growing number of older adults diagnosed with type 2 diabetes continues to be a major concern. Coupled with this issue is the fact that older adults are more commonly affected by type 2 diabetes and often face unique challenges compared to younger adults with diabetes. Although the self-management barriers identified through the perspectives of older adults in this review can be multifaceted and individualized, they are often preventable or reducible. Therefore, recognizing and understanding these barriers provides a foundation for health care providers to improve support with a larger goal of improving outcomes and well-being of older adults self-managing type 2 diabetes. Liddy, C., Blazkho, V. & Mill, K. (2014). Challenges of self-management when living with multiple chronic conditions: Systematic review of the qualitative literature. Canadian Family Physician, 60, 1123–1133. Sandelowski, M. & Barroso, J. (2007). Handbook for synthesizing qualitative research. New York, NY: Springer. 1. Was there a clear statement of the aims of the research? 4. Was the recruitment strategy appropriate to the aims of the research? 5. Were the data collected in a way that addressed the research issue? 6. Has the relationship between researcher and participants been adequately considered? 7. Have ethical issues been taken into consideration? 8. Was the data analysis sufficiently rigorous? 9. Is there a clear statement of findings? 10. How valuable is the research? Ms. Saunders is Senior Lecturer and PhD Candidate, Kent State University College of Nursing, Kent, Ohio. The author thanks Dr. Christine Graor, Associate Professor, College of Health Professions School of Nursing, University of Akron, for sharing her expertise and feedback throughout the process of developing this manuscript. Address correspondence to Tina Saunders, MSN, RN, CNE, GCNS-BC, Senior Lecturer and PhD Candidate, Kent State University College of Nursing, P.O. Box 5190, Kent, OH 44242; e-mail: tsaunder@kent.edu.